Well, I’m officially going to have to change my “about me” page on Cincy Chic. For the past four years I’ve had it in there that one of my dreams is to ride in a hot air balloon. To be honest that was kind of a hint to my husband in case he was ever at a loss for what to get me for my birthday or Christmas. But I should know better than to be anything less than obvious with the male gender, haha! So, my friend, Rene, posted to her Facebook a couple weeks ago asking what was on her friends’ bucket lists. She was just curious and wanted to get conversation started, apparently. So, I posted “Ride in a hot air balloon.” She private messaged me immediately and said she had a friend who flies hot air balloons and that he would take us up. Granted, we were allowed to go up pretty much gratis (just paying the cost of gas) because he was finishing up his certification hours, and this was technically a “training ride” for him. So, there was a little risk involved. But he had been up in a balloon many, many times before, and there was a trainer on with us, so it wasn’t THAT big of a risk! I couldn’t believe it. I absolutely freaked out! I’ve been wanting to do this for YEARS! And here was opportunity knocking down my door! She set it all up and up, up away we went! Our balloon ride took us over Kings Island, the ATP tournament area and I-71. It was so quiet and peaceful (you know, except for the deafening blast of hot air every 30 seconds to make sure we stayed in the air). It was incredible and more breath-taking than I ever hoped it would be. But right before we landed we did what’s called a “splash and dash” for fun. It’s where you take the balloon over a body of water, in our case a pond in a residential area, and have it skim across the top of the water and then blast hot air into the balloon to bring us back up. This takes a ton of skill and obviously can go horribly wrong if not done correctly (hello, we were basically in a wicker basket attached to a big balloon). But Eric pulled it off flawlessly. You should have seen the faces of the people out on their decks watching us in that neighborhood though! haha! I didn’t realize this but you don’t land in the same spot you took off from. And you never really know where you’ll land. Eric decided that a church playground area was a good spot for our landing. But it was right next to the neighborhood where we made a scene with the splash and dash, so every kid ran out of their houses to see us when they realized we were landing. Kids came out of the woodwork, no joke. Within minutes, there had to be 60 kids surrounding the balloon, hopping in the basket and “helping” Eric and his crew get the air out of the balloon. It was pretty funny. So, after they got the balloon packed away, we drove back to our cars and I got my certificate of completion. As if all this wasn’t enough, Eric, who is also a Sommelier at A Bottle or Two in Mason, broke out a bottle of Moet champagne to toast to this big bucket list item being officially checked off my list. I know I usually just blog about fashion and beauty here on my “Chic this Week” blog… but it was one of the most surreal experiences of my entire life and I wanted to share it with you. A huge thanks to Eric Faber with Balloon Adventures who took us up and my friend Rene for putting this together. It was a dream come true! Check out the slideshow below that takes you through my adventure one picture at a time! Enjoy! I hope you get the opportunity to check something off your list this weekend! 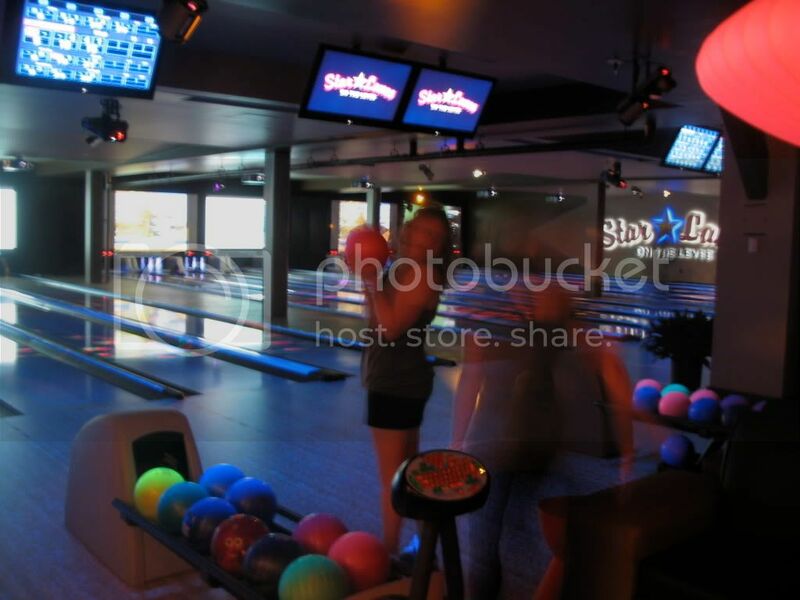 Star Lanes: The Chicest Bowling in Town! 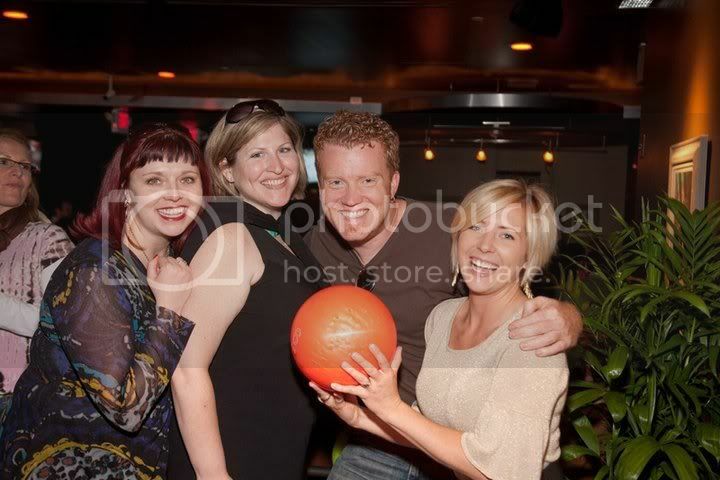 Monika Roberts, Katy Crossen, Joe Busam, and me at Star Lanes! When I lived in Philadelphia, my favorite pastime was bowling. Normally, “bowling” conjures up images of ugly shoes, smoky air and cheap beer. But at my bowling hotspot in Philly, it was quite the contrary. The place was called Lucky Strikes Lanes, and it had upscale bowling alleys with lane-side food service and lounges. They had the best sushi and the yummiest cocktail concoctions. Low and behold, three years later, I get an invite for a sneak peek of Star Lanes, the newest “boutique bowling center,” in Newport KY. After a little digging, I discovered that Star Lanes is owned by Lucky Strike Entertainment, who also owns Lucky Strike Lanes in Philly. Ah, my posh pin prayers were answered. There is a Gutter Ball God! 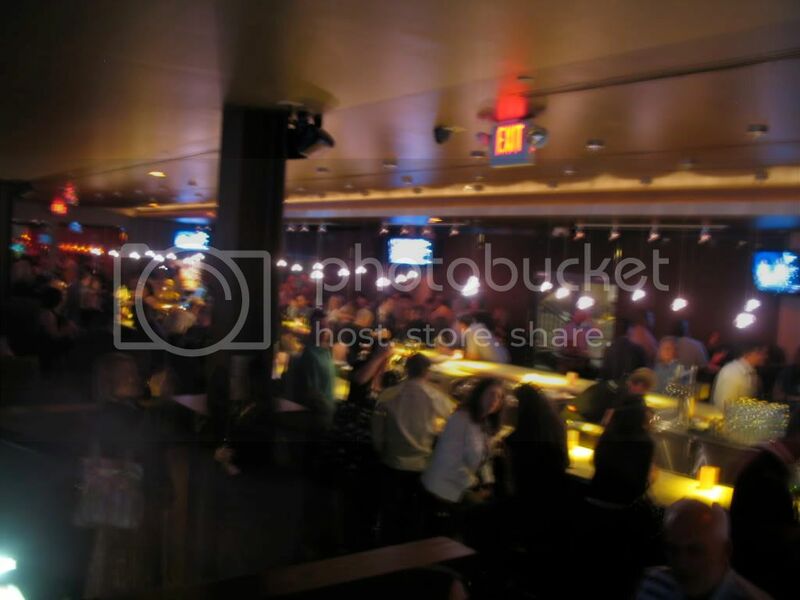 So, last night I went to the pre-opening party and man was it packed. All 24,000 square feet. They kicked things off in style. They served up free food and drinks, as well as free bowling for several hours. Granted, they didn’t have nearly enough bar staff to handle a huge crowd who wanted to take advantage of the complimentary cocktails. But that’s honestly my only complaint. The food was amazing and the lanes were lush. Can’t say anything about the cocktails because I never actually got one despite waiting patiently and batting my lashes. The place is HUGE. It basically took over the space of three (if not more) restaurant/bars: Cafe Istanbul, The Reserve and the art gallery space. I snapped a couple pics and took the below video so you can get an idea of what it’s like. Definitely worth checking out! Lots of chic events going on tonight! I already told you where I’ll be tonight. Blowdries and Baubles at the Chambers Packer Studio. They were asking for RSVPs, but I know they wouldn’t mind if you came by to join the fun with us! I’m going in to get my hair done this afternoon (and boy do I need it… my roots are almost two inches long… eek!) so I’ll be debuting the new look. And they’ll have their stylists giving tips on different hair types and talking about trends too. Oh, and cocktails…it is Friday after all! YAY! If you’re in West Chester there are a couple events up your way tonight. As I told you before, Bajon Salon is celebrating their 10 year anniversary and are doing giveaways, discounts and cocktails tonight at their salon. 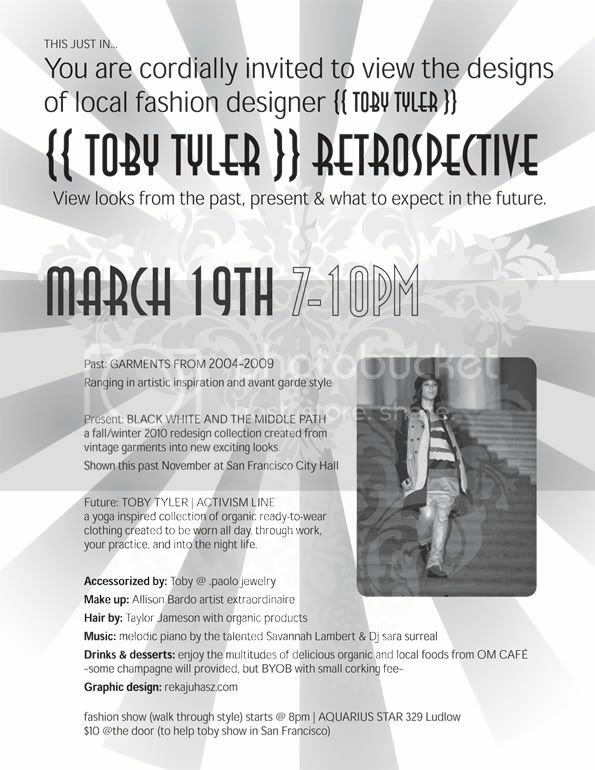 If you’re in the mood for something more fashion-forward, a fashion designer friend of mine, Toby Tyler, is having a fashion show event tonight in Clifton. Click here to view the invite and more information.